Monte Carlo Retreat is on a small quiet residential complex. it is made up of a few villas and apartments and is conveniently located in Central Arpora. It has a large swimming pool. The on site pool is for the use of all site guests during pool hours. A beautiful spacious villa located in the heart of Arpora, lounge around the gardens or take a splash in the pool. The site is quiet and has views over fields, idea for watching the local wildlife. 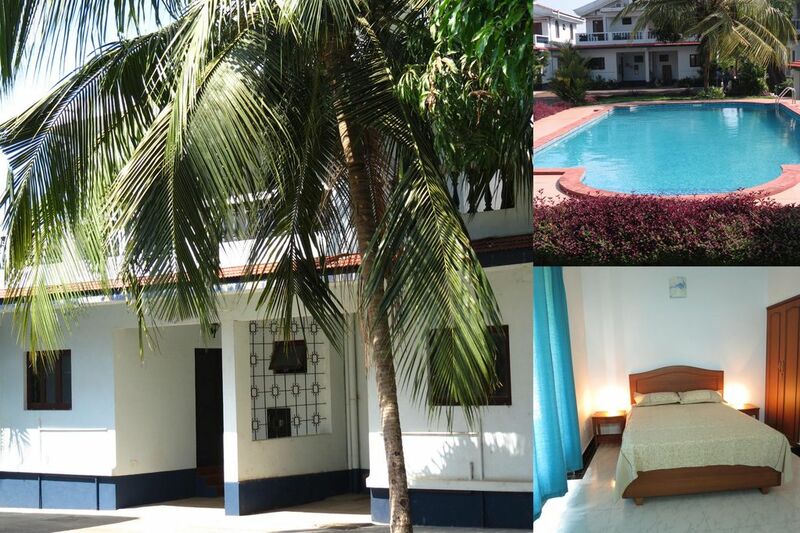 Shops and restaurants are very close by making this a good location for a family stay in Goa. The kitchen is western style and modern open planned. This room is light and spacious with an en suite leading off with tiled floors. This room has an en suite and a door leading to the terrace. Monte Carlo Retreat has beautiful gardens on the first floor there is a terrace overlooking the pool from the rear door there are steps leading to a patio area used by the villa on there you can sit out and relax using the table, chairs and parasol provided. Wi-Fi is provided however, connectivity is completely based on weather conditions and service from the internet service provider. Please understand that it's not in our hands. Please Inform us if you are facing issues, we will send in a complaint, and try to get the issue resolved as quickly as possible. - this is a self-catering serviced villa it has a lock box outside the front accommodation. We are on site if needed. You will be met at the airport by our driver if you have requested him. I will provide my Whatsapp no for communication. Quiet and peaceful but only minutes away from shops, restaurants and bars, you can walk to Arpora within 15 minutes. Arpora has a local supermarket and wine store plus fresh fruit and veg for shopping needs. ATM’s, & chemists. Calangute and Baga is 5 minutes away by Bus, Tuk-Tuks or taxi. We have taxi driver and tut-tut driver numbers on request. Taxi drivers won’t miss you! Taxi, taxi. Yep you won’t go far without being asked if you want one. There are lots to choose from. If you want to be more independent, bike or car hire is easily done. Buses to Calangute or Anjuna run close by. We are a property management company that has been trading in Goa since 2007. The company is run by UK nationals that have resided in Goa for over 14 years and have reliable trustworthy staff. We aim to be helpful every step of the way from booking to departure by keeping you informed and being there should you require us. We are here in Goa to be of assistance to you during your stay. We are here to take care of maintenance issues and provide cleaning with clean bed linen according to your schedule. We are just an SMS/text message away if problems arise. Before you arrive we give you the option to book one of our trusted drivers. This can take the stress out of reaching the property as a driver can be sent to the airport/station with a name board and collect you from there. The added advantage of that is that he will be in possession of the keys and will know the location of the apartment. Very handy if arriving after dark. Upon booking this property you will have access to a guest app which can be accessed easily from any mobile device. This will contain important information such as directions, maps, arrival information, internet and WiFi codes. Meet greet and property walk-round for staying guests Property cleaning before guests arrive, mid stay and on departure Linen changes during guests stay Welcome essential packs for guests Emergency contact for guests. AbraCasa Hospitality are available on whats app to answer queries or assist with an issues. We at AbraCasaGoa com once the deposit is paid will send you welcome and check in details. We are here in Goa to be of assistance to you during your stay and take care of maintenance issues. We can arrange your transfer from the Airport payable directly to the taxi driver. Please note that this is self catering accommodation. As such if you are looking for services of starred hotels then this may not be the right choice for you as you don't get daily housekeeping included nor any room service as in hotels. Daily housekeeping can be made available at an extra cost but there is no room service. Please be sure about your comfort level with all this before making a booking. If you are not sure then discuss it first before booking. Instant booking only for couples or families, as THE SITE RULES are very strict. Unbelievable place, with unbelievable responses. Would like to visit again for sure. Nice clean and fully furnished villa. Though there were AC in both the bedrooms, an AC in the living area would certainly have made the trip more comfortable. If you are travelling in your own car parking sure is an problem as you have to park your car outside the gated compound and its unsecured. I had to park outside near a coconut tree, which damaged the front windsheild of my car costing me Rs 15000/-. Hunt for a bargain at Anjuna Wednesday Market. There are 2 Saturday Night markets in Arpora. Bask in the sun and sand at Anjuna, Vagator Beach, Candolim. Beach Water sports enthusiast? Check Calangute or Baga Beaches for its myriad water sport options and indulge in windsurfing, scooter rides, banana rides etc. Check out some of Goa’s happening bars, nightclubs and discotheques, Mayem Lake and the Kesarval spring are ideal picnic spots.Try your luck at Goa’s famous casinos. Looking for a place of peace where you can pray or reflect? Head to the blessed Saligao church. Arpora is much smaller and quieter than nearby Baga and Calangute. This is a very popular resort for short breaks. Complex is about 25 mins walk or 5-minute taxi ride to the nearest beach in Baga. The beach stretches to the other beaches of Calangute and Candolim, all have plenty of beach shacks to choose from all serving a wide range of food and drinks from morning to night with something for everyone, there are also jet skis, parascending and banana boats. About a 40-minute taxi ride away are the beautiful quiet golden sandy beaches of Ashvem and Mandrem with palm trees and stilted bamboo beach huts to stay in. Arpora is buzzing at night but not loud. It’s a small town so has lots of local charm but it has lots of tourist bars and restaurants so you will never be stuck for a place to eat. Baga and Calangute beach is just a short hop away by bike car taxi or bus. Arpora hosts two markets; the river at Baga locates Mackie’s Saturday Night Bazaar. The Saturday night market in Arpora or the famous Wednesday flea market at Anjuna Beach, is close by as well, and will satisfy even the best shopaholics. The nearest beach is Baga beach. Baga beach is situated to the North of Calangute, in Goa. It is a place where there are a lot of restaurants, hotels and shops and it is usually packed with tourists. Baga Beach in North Goa may be touristy and busy but for those who like action, it’s one of the most happening beaches on the coast. There are various watersports along the beach including paragliding, boat trips, wakeboarding, windsurfing, kitesurfing, or take a ride on a jet ski. Dolphin spotting trips and island trips are on offer and there is plenty of scope for bird watching. Yoga classes are very popular. Fishing trips can also be arranged. Fine dining restaurants, along with a pulsating nightlife. However, many people are simply content lazing on the sun lounges in front of the beach shacks all day and feasting on a steady supply of food, beer, and cocktails. Baga beach however is less crowded when compared to the Calangute beach. The Baga Creek joins the sea to the North. To reach the opposite bank there is a small concrete bridge. At the mouth of the creek is the bus station from where buses run for Panaji and Calangute, the road coming from Calangute ends here. Taxis are available and there are also lots of places where one can hire scooters or motorbikes. Baga is quite famous when it comes to nightlife as one can find some very popular clubs and discos here. People here in Baga are generous and entertaining. Explore along the North Goa coastline with its stunning white sands and blue seas and you can find many empty peaceful coves for that true 'Touch of Paradise'. North Goa on the shores of the Arabian Sea. It lies 10 km away from Panaji, capital of the Indian state of Goa. The population of Goa is a mixture of Christian, Hindu and Muslim so festivals are celebrated almost daily giving Goa an almost non stop party atmosphere. Enjoy the sights and sounds of the colourful and exotic night markets where one can buy locally made, hand-crafted goods, antiques as well as European goods. To get a sense of the history of Goa take a tour to Old Goa with its fascinating temples and churches or visit the Spice Farm and help to bathe the elephants. The waterfalls at Dudhsagar are also a very popular where you can feed the monkeys and then take a jeep ride through the National Park before cooling off in the natural lake at the bottom of the falls. Local supermarkets, chemists, banks (ATMs), opticians etc. can be found in all along the villages of the North Coast. Check out some of Goa’s happening bars, nightclubs and discotheques, Mayem Lake and the Kesarval spring are ideal picnic spots.Try your luck at Goa’s famous casinos.